CompTIA Linux+ and LPIC Practice Tests provide 100% coverage of all exam objectives for both the CompTIA Linux+ exams LX0-103 and LX0-104, and the LPIC exams 101-400, 102-400, and 201and 202, through 1,200+ expertly crafted practice questions. 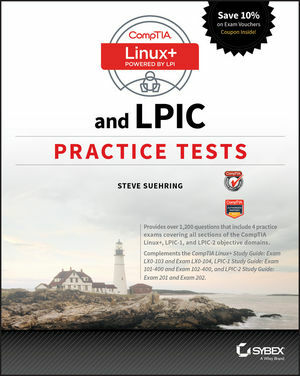 These easy to navigate practice questions cover the Linux+ and LPIC-1 exams, covering all 10 domains. The second part covers the LPIC-2 exam, covering all 13 LPIC-2 domains. An additional two 60-question practice exams per section help you gauge your readiness — and hone your test-taking strategy — well in advance of exam day, giving you the thorough preparation you need to approach the exam with confidence. Practice tests are among the most effective exam preparation strategies. These tests are designed to mimic the Linux+, LPIC-1 and LPIC-2 exams, giving you the practice you need to ensure you are fully prepared. This book can be used alone or with the Sybex study guides and deluxe study guides. Start preparing for your Linux certification today.